Some say a messy desk is a sign of creativity, but it can send out a sign of unprofessionalism to your colleagues, and there is nothing worse than having to sift through a pile of papers and stationary to find what you need. The best desk organisers and office tidies will hide ugly cables, conceal messy stationery and have your desk space ship shape in no time. Whether it’s a filing tray or a notice board, having everything in its place can help you work better and make your desk or office space look good. Many find that they are more productive when everything is tidy and there are a range of funky designs out there that can really make your desk stand out from the crowd. Rather than just chucking everything in a drawer, you’ll want to make sure everything is close by and easily accessible as and when you need it. Accessories such as pen pots and desk organisers will help you sort out your essentials and get rid of any unnecessary items to declutter your desk once and for all, making it easier to focus on your work. Desk organisers don’t have to be anything fancy – a couple of simple pots are enough to get the job done, but if you’re decorating your home office and want to invest in some smart accessories then there are some great options on the market to cater to all styles and budgets. Take a look at our list to inspire you to get organised. If you’re someone who is equally as obsessed with stationary as you are with designer gear, then this Lund London desk organiser is for you. It is very expensive, but you’ll have a place for absolutely everything and it’ll be easy to find and access whenever you want. This would also make an excellent make-up storage box for those who have way to many cosmetic product to fit in their make-up bag. If you want to neatly store your papers and envelopes, then this letter tray looks sleek and smart on any desk. It is a little smaller than expected for envelopes, but it fits A4 paper perfectly and sits neatly in the corner of a desk. If you need to add more storage space in the future, then these trays are stackable which makes for a great space saver. 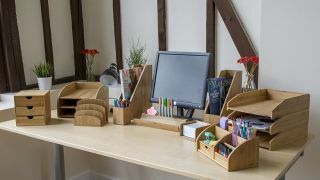 This basic desk organiser is great for students or those will small desks. It may not be the prettiest, but it is functional and can hold a range of items including pens, sticky notes, envelopes and it has a tape holder. This desk organiser won’t break the bank or take up too much space in the office. Get the professional man in your life this smart Ted Baker organiser to keep home offices looking tidy at all times. This box has a number of different sized compartments to keep things such as pens, phones, charging cables and even loose change. This would also look nice on a bedside table as a great way to keep your bits and bobs safe like rings and watches. Organise all of your post, newspapers, magazines and other documents in this hanging organiser. If you find you’ve always got letters or junk mail sitting on the side or on the floor by the front door, this is a great storage solution to declutter your hallway. It has to be mounted on the wall, but this does also make it a great space saver if you don’t have room for a cabinet or other storage device. It would look great next to the coat rack and is a good place to keep reminders. This pencil sharpener pen pot is simple yet effective and would look cool in any home office. If you know someone who is stationary mad, or on the contrary, can never find a pen when they need one, this pen holder will ensure they always have some to hand. It is a little pricey just for a pot, but is a good gift idea or a something a bit different to your bog standard pen holder that will brighten up your desk at work. This handy little caddy can keep your phone nearby on your desk while allowing you to keep it charged and store other items. If you have a small desk this is perfect because it doesn’t take up too much room and it keeps everything out of the way. It’s certainly not the prettiest, but it doesn’t look hideous either – a great budget buy that is super functional. Take a look at our article on the best desk lamps for another stylish functional addition to your home office. A comfortable office chair is also important - take a look at the best ones for improving your posture.